Electrical Dual Chamber Box Furnace for Heat Treatment of Machine Tooling - L&L Special Furnace Co, Inc.
L&L Special Furnace Co, Inc., has shipped a dual chamber heat treating furnace to a southeastern US manufacturer of various items used in the production of heavy equipment and transportation devices. The furnace will be used to heat treat the tooling used to manufacture these items. Its top chamber is used to harden tool steels while its bottom chamber is used for tempering, stress relief and pre-heating. 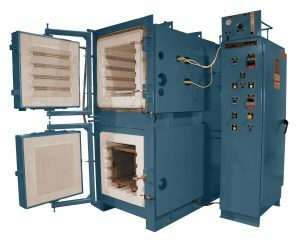 The L&L model QD836 furnace’s hardening chamber has an effective work zone of 16” wide by 16” high by 32” deep. The tempering chamber has an effective work zone of 14” wide by 14” high by 32” deep. The top chamber has a uniformity of ±20° above 1,200°F and the bottom chamber has a uniformity of ±10°F from 300°F to 1,250°F. The furnace is controlled by Eurotherm temperature controls with overtemperature protection. Solid-state relays drive the electric heating elements and include heavy-duty, long-lasting 11 Ga. thermocouples. All controls and fusing are in a side-mounted NEMA1 enclosure. All of L&L’s furnaces can be configured with various options and be specifically tailored to meet your thermal needs. L&L also offers furnaces equipped with pyrometry packages to meet ASM2750E and soon-to-be-certified MedAccred guidelines. Options include a variety of control and recorder configurations. A three-day, all-inclusive startup service is available with each system within the continental US and Canada. International startup and training service is available by factory quote. If precise temperature control and uniformity is key to your process, then L&L’s QD series is a great choice. Please be sure to visit our new website at www.llfurnace.com.